The new Hordes starter set includes two factions, 28 models amd everything you keed for you and a friend to start playing. I opened this box as a newbie. Because I’ve never played Warmachine. Or Hordes. Or Warhammer. Or 40k. I’ve always been intrigued by those kinds of wargames, but I have (for the most part) stuck to tabletop board games and RPGs. I have long used Privateer Press’ line of P3 paints, and I do love the detailed and action look of their miniatures. But I had never jumped in until Privateer Press was kind enough to send me a copy of the Hordes Two-Player Battle Box. And now I’m fairly sure I’m a Trollbloods guy. Wanna know exactly what’s inside? 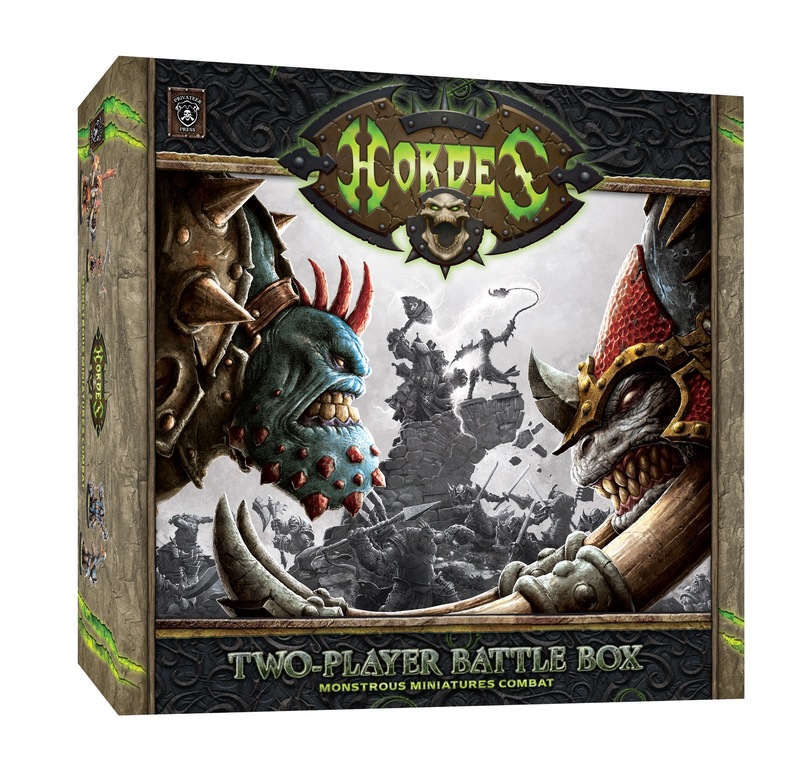 Check out my unboxing of Hordes’ new Two-Player Battle Box. As a beginner, I found the two-player box to be exactly what I need. I don’t know the lore. I don’t know where to start with the minis. I don’t know the rules. I don’t know how to play. The box had everything: paint guides, scenarios to learn the ropes, a comprehensive rulebook, a map and tons more. If you’re looking to try out Warmachine or Hordes (or to beef up your existing armies), check out this box. Let’s start with the miniatures. They’re pretty sweet. I’ve seen Hordes minis before, but never quite so up close. The minis come bagged in pieces (no sprues!) and were pretty simple to assemble. 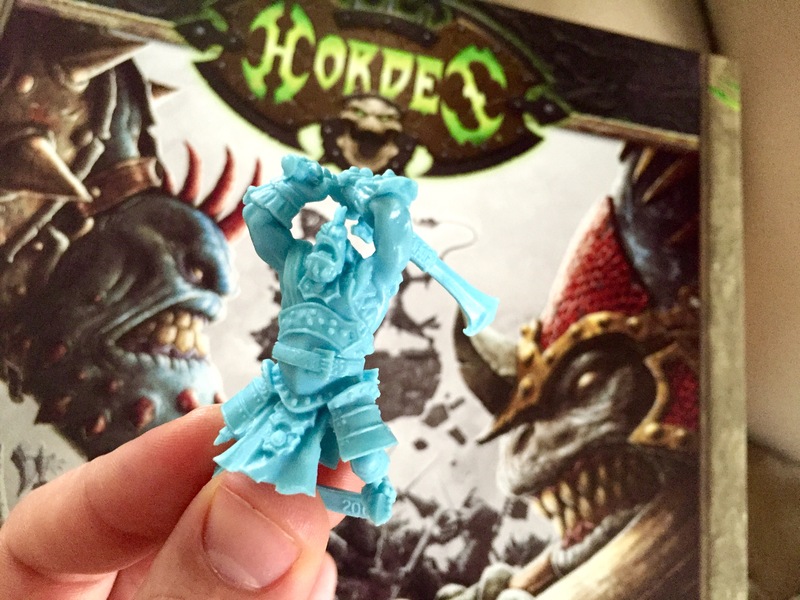 If you’re completely new to prepping and assembling minis, the included guides will help you. I know my way around cutting flash and applying superglue, so I had that down. That said, I am happy to report the plastic minis were easy to assemble. These were cast in hard plastic, which held a lot of detail. Mold lines were well-placed and the models I put together were easy and looked great. Even the most complicated models took no longer than a minute or two to prep and assemble. The Trollbloods models, pictured above, were cast in light blue plastic, and the Skorne came in dark red. If you don’t care to paint minis or if (like me) it always seems to take you awhile, you’ll easily be able to tell your two armies apart on the battlefield. I love the look of them. Rather that stoic, battle formation poses, these guys are hefting giant swords, calling out battle cries and casting spells. So far as I can tell, most minis in the box are recent, but they are mostly previously existing models. They’re not new sculpts. But the couple new models are really cool. Ragnor Skysplitter and Beast Master Xekar are pretty much brand new, and you can only get them in this box or via the Skorne or Trollblood army starter boxes. Ragnor is freaking awesome, and he’s my favorite sculpt in the box. He’s covered in rune stones and hefting a crazy hammer. He’ll be awesome painted up. I haven’t gotten all the way into painting them yet, but they took primer well and held their detail. I did slap a little P3 Skorne Red and some highlights on one model, and they take paint quite well. I’m excited to get an assembly line going and crank out some finished models. The rest of the box is everything else you need. I absolutely love the introductory guides for each army. I know nothing about this world, so reading about the reach of the Skorne Empire is really cool to me. And what is mortitheurgy? I must learn more. More importantly, included in those army booklets are super helpful prep and painting guides. Also included is a digest-sized version of the new Hordes: Primal rulebook. It’s 112 pages whereas the brand-new Mk. III hardcover is a full 344 pages, but it still describes rules basics, models, army building rules, gameplay, combat, terrain, scenarios and a ton more. I personally won’t need more than that. A fold-out map has two sides, one with a few terrain elements laid out and another with a grouping of trees in the center and several dots marked across it. This correspond to another booklet, which lays out a series of scenarios that will help you and another player learn the basics of combat movement and more. Those are all great, but I was disappointed in a few included materials in that scenario booklet. A sheet of tokens and templates are meant to be photocopied and reproduced yourself and a pair of unit cards (representing a pair of models used to learn via those scenarios) in the back are the same. In a box that runs about $90, you’d think it would include a single cardstock sheet with punch-out templates and tokens. And with a dozen or so unit cards in the box, why not print two more for the “learning” cards? Understandably, this is a pricey box to put together, so my guess is they tried to cut some costs where possible. There are already plastic counters and spell markers in the box, so not having the templates and tokens isn’t the worst thing. So how much would all of this cost on its own? The models alone would be $50 for the fennblades and $40 for the other four Trollbloods (if you bought them in the army starter box), and that hits your MSRP right there without even counting the Skorne. So yeah. This box is a helluva deal. Have you picked up the new starter boxes? Tell us what you think in the comments velow.